One of the best hostels I’ve ever been to. Clean, perfectly organized and all over amazing. The vibe was perfect at this hostel. That’s thanks to the welcoming staff and the amazing layout. Gated entrance to the location opened up to a courtyard where guests are free to socialize. Great community atmosphere. Would definitely stay again! Staff is really nice and the location is perfect if you want to be near the beach but also shops and night life :) I recommend it. The staff was very welcoming and accommodating. The facilities were clean, and well kept. My only complaint is that there needs to be something to hang or set clothes on while in the shower. SOLID pick definitely worth checking out. 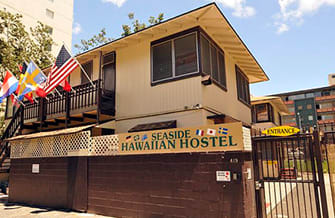 Seaside Hawaiian was honestly one of the friendliest and most enjoyable hostels I've ever stayed in! Staff and guests were all lovely, interesting, and welcoming to solo travelers. I loved the courtyard area offering comfy lounging and hanging-out spots, shade for most of the day, and plenty of opportunities to make friends and hang out in the evenings without walking into a raging party. The atmosphere is really wonderful—if I find myself back in Honolulu, I will definitely stay here again! Place definitely needs some couches and more comfortable seating. Could definitely use some decor and more personality. The staff is really nice. It was nice location good neighbor and cheap room. I recommend this hostel!! Was decent enough. Saw some cockroaches in the bathroom but it’s a tropical island so bound to be bugs. Lots of mold in the shower. They did change out the very moldy shower curtain, but still mold on walls and ceiling. There was a band aid on my bed railing which was gross. They say free breakfast but that’s pretty much just toast and jam. If you want anything more like a muffin you have to pay. 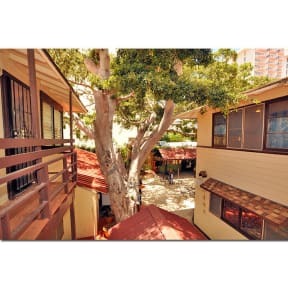 The location is close to Waikiki and the shops which is convenient, but very very loud at night.